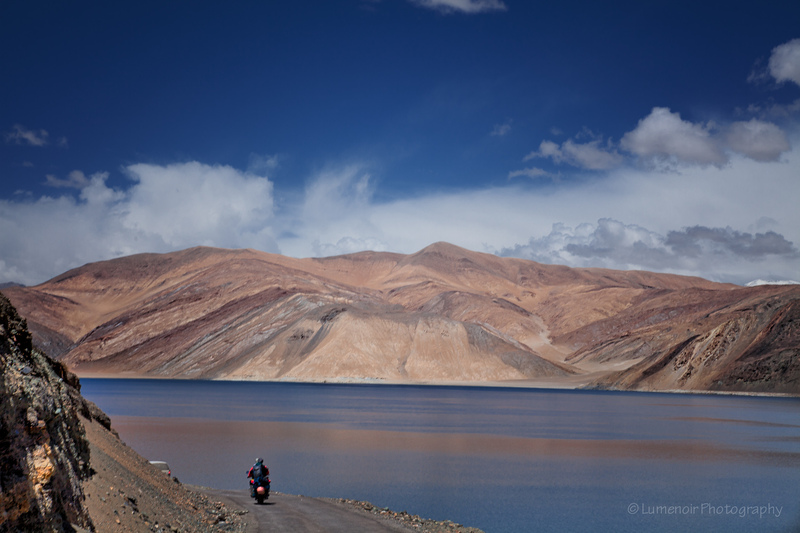 Riding Into The Blue Of The Pangong Lake. - Travel Soul Therapy Blog. It was not fun to think about putting wet shoes back on, yet a thought of getting to Pangong soon from this empty side was invigorating. 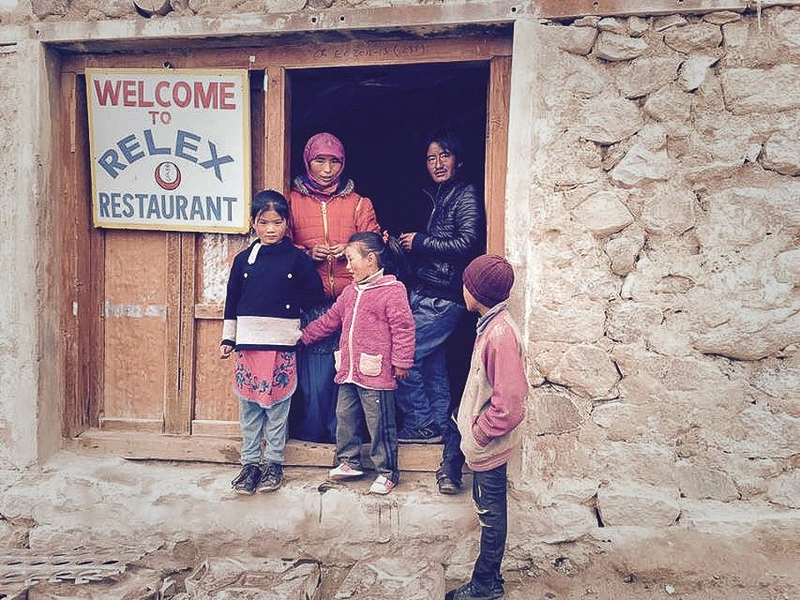 After having an organic egg omelette at the Relex restaurant, that probably meant to say “Relax”, we mounted our faithful Indian motorcycles and begun to weave a big circle through Chishul that would take us in the direction of Lamle, next nomad settlement. 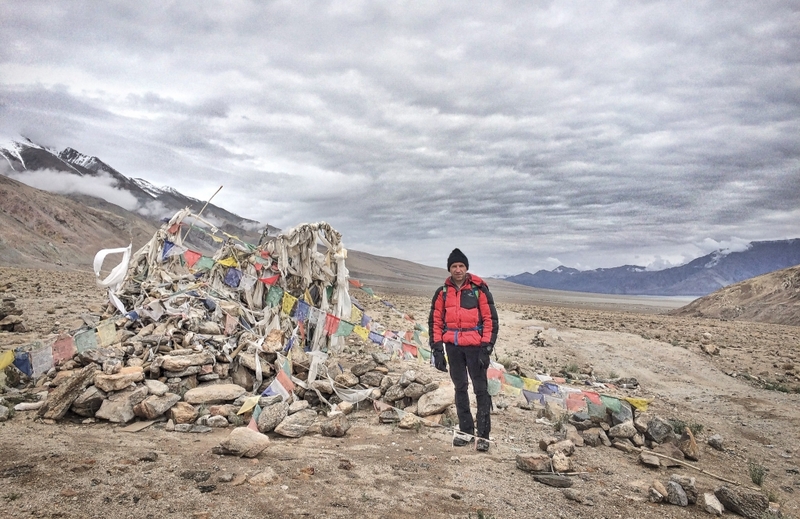 The sky had a solid cloud cover when we approached a huge pile of rocks with strings of prayer flags strung up over them. It was splitting the road in the middle, separating the tracks by directions. According to Tibetan Tantric tradition one should always pass the chortens, stupas and markers clockwise, thus turning a wheel of Dharma by engaging one’s own mindfulness. 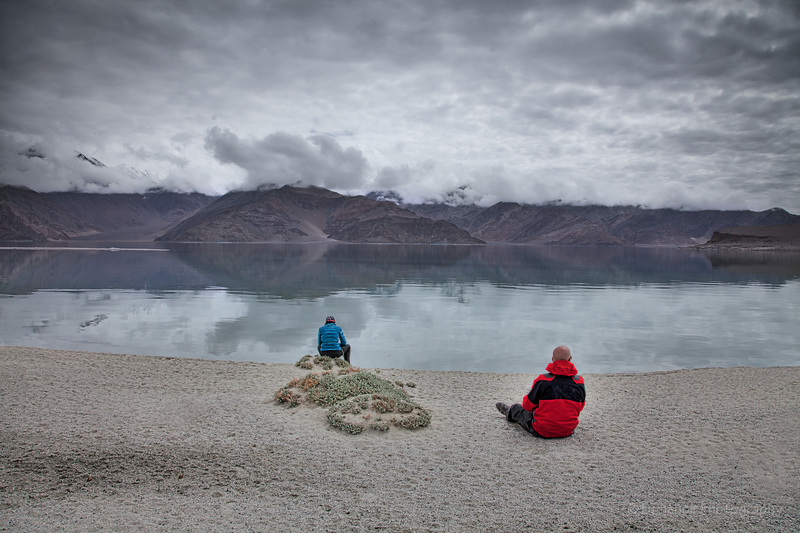 Soon after the pass barely worn tracks led us to see the sliver of Pangong Tso. 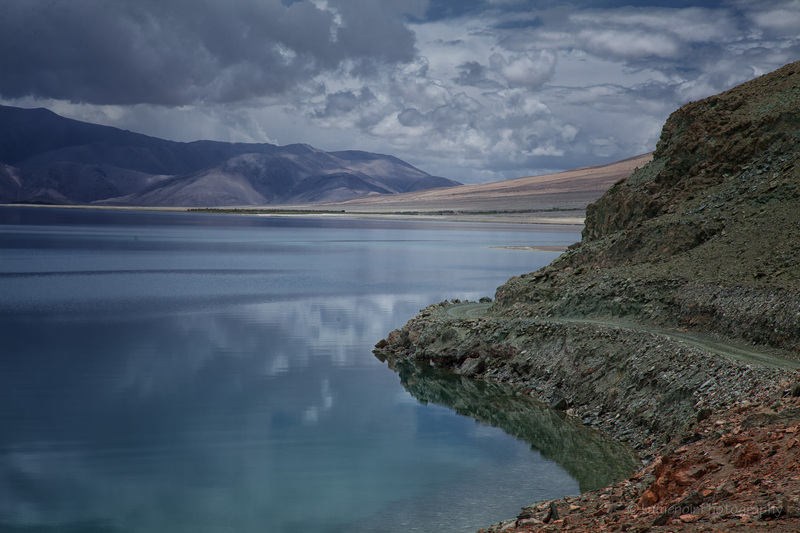 It is Tibetan for “long, narrow, enchanted lake”. Within half an hour we rode to the water edge of a sandy shore completely empty. exquisitely tranquil and utterly quiet. 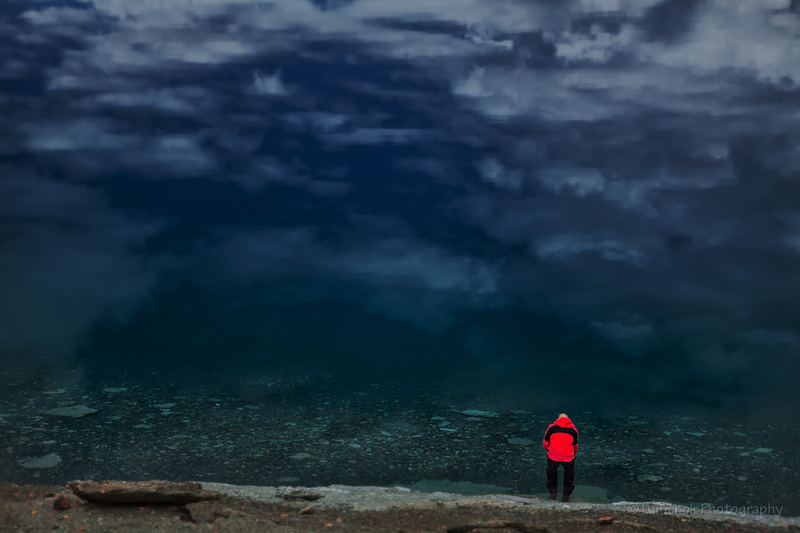 The six-thousanders towering above the blue-gray water were lurking behind the clouds framing perimeter of the lake. This was a perfect place to stretch and lay down, even to try to dry clothes and boots still wet from the night before. A perspective that in this moment we were in a place where there was no one for miles in a seldom-travelled territory at the peacefully shaping morning after a storm right now is remembered as nothing more than a vivid dream. And here are some facts that help to appreciate exotic beauty even more with unique features. 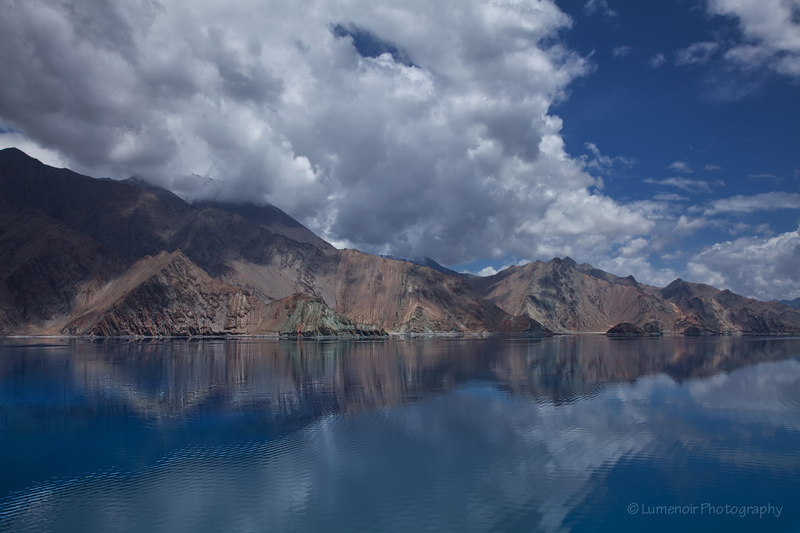 It is a large landlocked lake laying at a height of about 4,350 m (14,270 ft). Its body stretches for about 135 km (83 mi) from India to Tibet. Its water is saline, but it freezes completely during the winter. 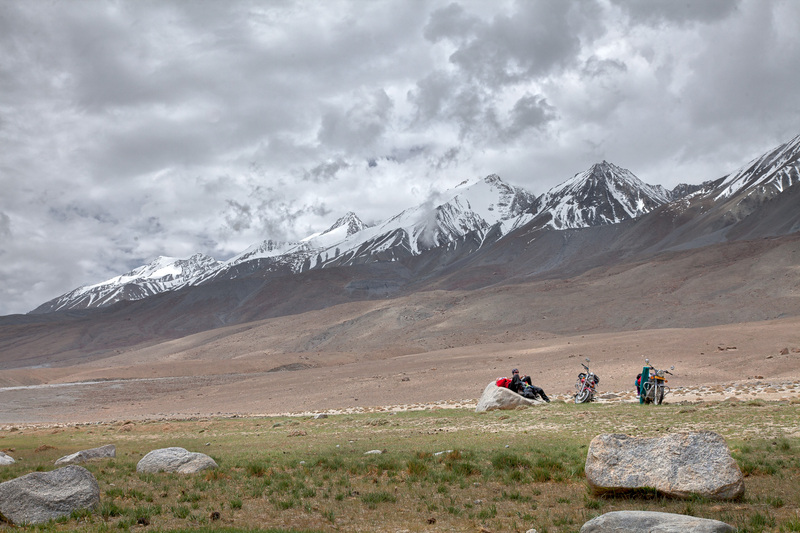 More than half of its length situated in Tibet. The lake is 5 km (3.1 mi) wide at its broadest point. All together it covers 604 km2. Being relatively alone and surrounded by this vast and open space gave a feeling of appreciation to imagine how the Earth has been undisturbed by human intrusion and development for thousands of years. Somehow with tacit agreement we all felt an appropriateness of spending time in calm and quiet contemplation. We all almost simultaneously fell into a pleasure of silent contentment. This huge container of pristine water surrounded by untouched mountain peaks and valleys drew each one of us into communion with its ancient energies. That which was timeless in each one of us somehow was finding its equal reflected in primordial state of the nature. Time felt elastic and lacking the texture, that pulse of hurry that ordinarily drives us to be somewhere, to do something or even saying something in order to feel that we exist. This was was a pleasure of serenity. I sensed a root of deep inner bliss was beginning to glow melting away residual anxieties and worries into profundity of the present moment. 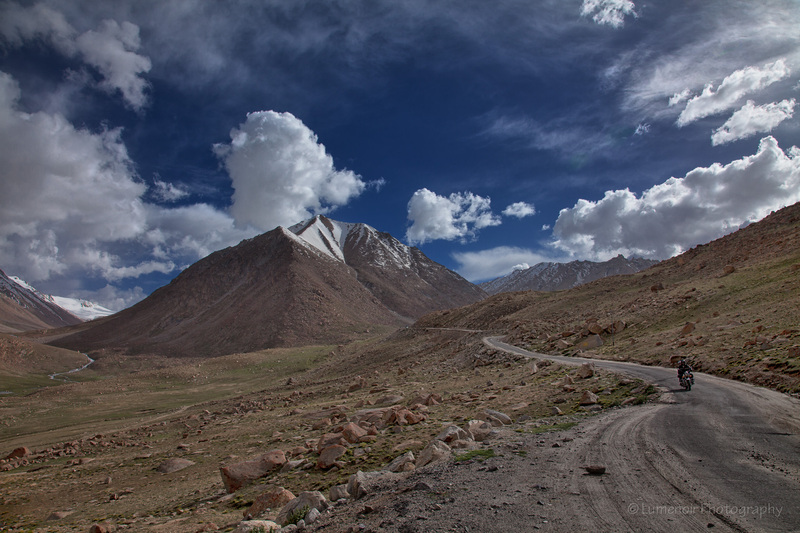 The plan was to be back in Leh by the nightfall and that was our clock. Back in the saddles and in an hour we were at the main entry road to Pangong surrounded by many local tourists – slightly dressed down business people and office workers escaping the heat of Delhi with their wives and children. 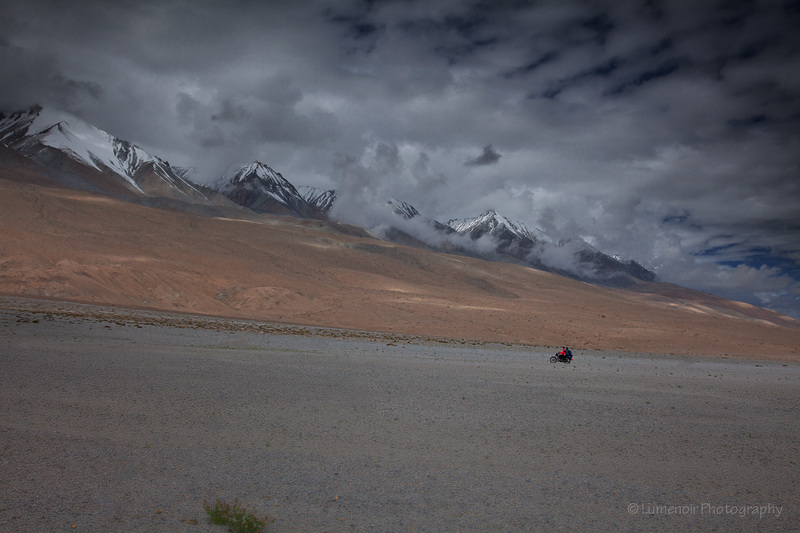 We had about four hours left to ride with only one major pass to cross Chang La (5380m). The way home was wrecked by the rain and mudslides but there was road.